In 1964, 25 Catholic families began gathering for Sunday Mass at the popular Carefree Inn. A visiting priest or a priest otherwise known as a "supply priest" would say mass for the Catholics living in the far Northwest section of the "desert foothills" area of Maricopa County. At that time, the mission in Carefree, AZ was a part of the Diocese of Tucson, and a mission of Our Lady of Perpetual Help in Scottsdale. 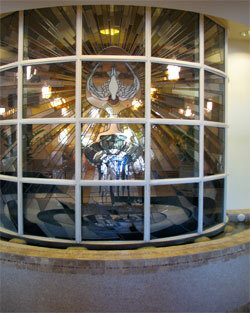 Over 8 years, and after gaining another 45 families, Our Lady of Joy was established as a parish on November 14, 1972. Fr. John Doran was the founding pastor. 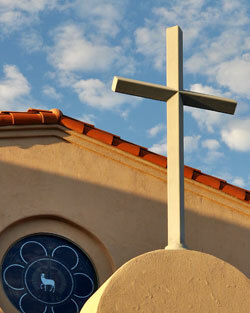 Pope Paul VI established the Diocese of Phoenix on December 2, 1969. Parishioners pooled resources to purchase 10 Acres of land toward building of a parish church and campus. Ironically, the land purchased to build our parish in Carefree had been used for some years as an official "dump." 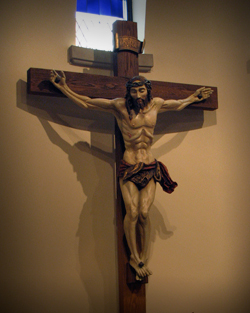 In hindsight, we could make a connection with Sacred Scripture, Psalm 118:22, "The stone rejected by the builders…" The psalmist's prophecy is indeed about the glory of the Lord brought about through His suffering. A piece of land once thought suitable for a dump is now a beautiful property set aside for God’s people to encounter salvation in Christ Jesus. 1974, just two years after the parish was officially founded, was an historical year. Fr. John Voigt became the second pastor and the first building was constructed. The building was an all-purpose type building which is now our Preschool. This particular building has sheltered many events in the life of the parish. The initial usage made possible a new space for worship of God, community meetings as well as space for offices and a small priest's residence. By 1980, the number of children in the parish had grown to about 50. In order to offer religious education classes, a construction trailer was added to the parish grounds, providing room for classes and additional office space. The parish registration numbered 165 families in 1980. 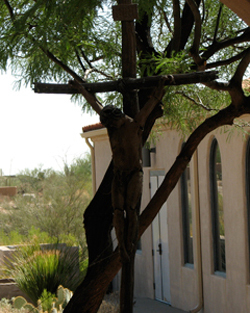 Carefree and Cave Creek grew slowly but steadily in those years, and by 1985, 320 families were registered at Our Lady of Joy Catholic Church. It was then that plans were drawn up and funds were saved to build a Church in the center of the campus. The Catholic Church of Carefree under the continued patronage of the Mother of our Lord, Our Lady of Joy, was dedicated on November 8th 1987. The original Church was able to seat about 450 people for each mass. A rectory (residence for priests) was built in 1991. Initially, it was projected that somewhere around 2015, there would be a need to expand the church. The expansion occurred eight years later in 1995, when the church was built out to its present size and configuration. After the expansion of the Church, the parish center/hall was constructed and permanent parish offices were built. A short time later, under Monsignor Moyer (3rd Pastor of Our Lady of Joy) the Parish Council urged him to renovate the old parish hall, the original building of the campus, to create a Preschool. The growing numbers of people determined to move into the Foothills area made a significant difference, beginning in the mid - 1990's. New communities sprang up throughout the parish boundaries of Our Lady of Joy. An early 1990's study by the Parish Council predicted the parish would reach the 2,000 family mark by the year 2000. The actual number of families at Our Lady of Joy at the close of the last century was nearly 3000. In 2001, a new neighboring parish was carved from the large parish boundaries of Our Lady of Joy. St. Gabriel the Archangel put down roots just over 7 miles to the Southwest of the parish of Our Lady of Joy. Our Lady of Joy Catholic Church is a beautiful blend of young families, empty-nesters, and retirees, with mostly year-round residents. In the past decade, Our Lady of Joy has grown from a staff of one priest and one combination secretary/R.E. Director, a teen minister, and a plumber. Today, we have 2 priests, a staff of 19 with 7 buildings and some approximately 1800 registered families. The most recent renovation of Our Lady of Joy began in May 2017 and included a redesigned Sanctuary, new pews, a new sound system, and new flooring, paint and religious art. The renovated church reopened at a mass on December 10, 2017, with the dedication and blessing of a new marble altar by Bishop Thomas J. Olmsted.